This is an interesting move. In the lead up to Mother's Day (which is this Sunday for those of you who still haven't got something for your Mom), Facebook has added a new 'Reaction' to the five options, in addition to 'Like', which they unveiled back in February. The new addition was spotted by Twitter user Sredeev Sharma and Facebook later confirmed to The Verge that they're testing the new temporary option in some markets - Facebook didn't note which markets specifically (though the US is not one of them). According to The Verge, users will be able to leave a 'Thankful' reaction - represented by a flower - up until Mother's Day. After that, the flower response will be no longer available, but it'll still appear on any posts where it was used. The addition of a seasonal tie-in for Reactions raises new considerations, particularly as to how it could relate to future opportunities for the tool - it's easy to imagine a Christmas tie-in, for example, or a St Patrick's Day clover. Could temporary Reactions extend to events like The Oscars? Could they be sponsored? That seems like a fairly big jump to make with such a prominent feature, but no doubt Facebook's considering all options, and will be examining the audience response to the Mother's Day flower to help guide their future direction. On audience response to Reactions, social analytics firm Quintly this week released a study into how Facebook users are adapting to the new feature more widely. In order to get a handle on how often people are using the new response options, Quintly analyzed 130,000 Facebook posts and measured how often Reactions were used, and which were the most popular. Their overall finding? Reactions are not being used a heap. "Taking a look at the share of interactions it's clear that 97% are likes, comments and shares." 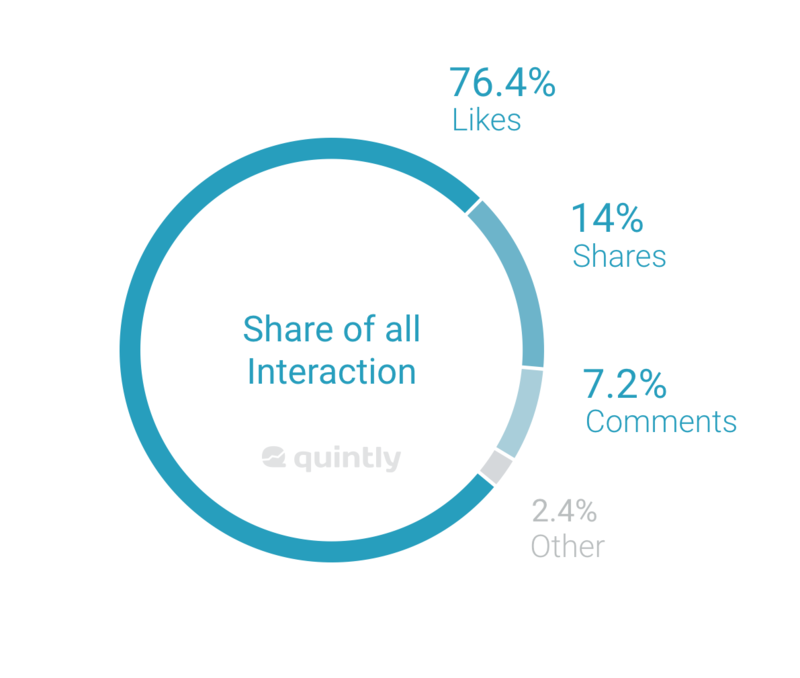 According to Quintly's data, Reactions are being used on fewer than 3% of posts, with the Like button still outperforming the others by a huge margin. Quintly broke this down further, examining which Reactions are getting the most use amongst that dataset. As you can see, the 'Love' emoji is way out in front, with 'Angry' and 'Sad' the next most popular. Quintly's interpretation is that the popularity of 'Love' indicates that users tend to interact more with content that generates positive emotion, though given the low rates of Reactions use generally, it's difficult to draw any definitive conclusions. 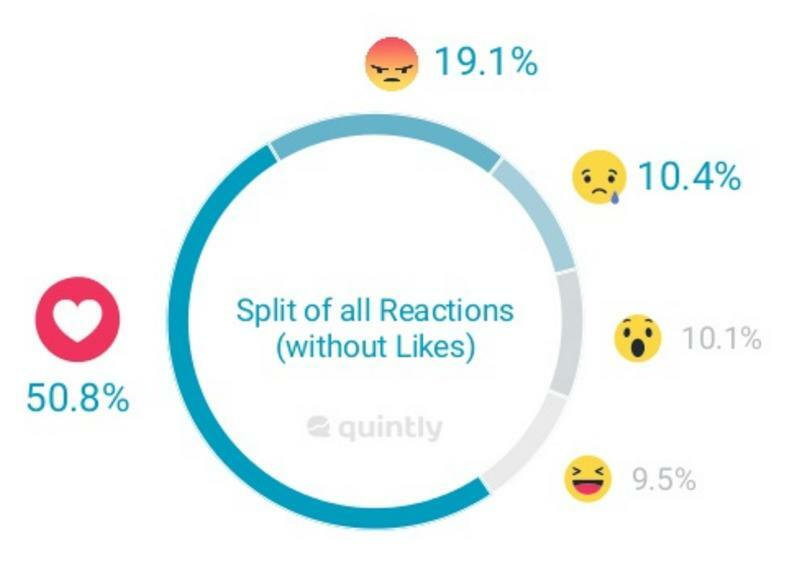 Quintly also found that Reactions adoption didn't vary much based on the audience size for each Page, with the percentage of Reactions remaining fairly stable, relative to other interactions. The numbers show that, overall, users haven't adapted to Reactions use yet, and most are still going about their Facebook activities as normal - which means just pressing 'Like' on the content they're interested in and moving on. An important factor in this would be the way in which Reactions are applied. To use a Reaction, the user has to hover over the 'Like' option, then select the Reaction they want once the options appear in a separate pop-up. With a Like, however, you can just click on the button, which is immediately present on screen, and you're done. While Reactions were designed with speed of response in mind, giving mobile users, in particular, a faster, easier way to convey their feelings about each post, the additional action of having to wait for the Reactions screen to appear, then select a response option, actually adds to time to the process, even if it's just a few tenths of a second. 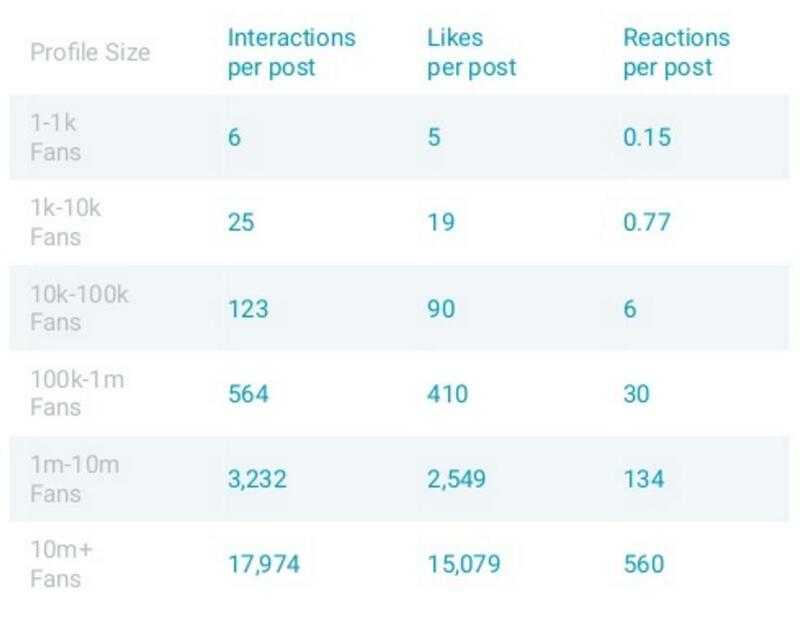 That additional time may just be too much - if Reactions were actually listed at the bottom of each post alongside the 'Like' button, rather than in a separate pop-up, you'd likely see their usage rates jump significantly. Given this, you can expect that Facebook's also looking at the adoption rates and usage patterns - it wouldn't be surprising to see the Reactions feature more prominently on posts in future. Overall, it's hard to make much of Reactions at this point. The adoption rates seem relatively low (the data from Quintly matches anecdotal evidence we've seen from other Pages) while the addition of a seasonal response option opens the door to other uses beyond basic post interaction. But given those low usage rates, is Reactions something users really want? And if so, is the value of Reactions data high enough for Facebook to find new ways to better promote the option? It'll be interesting to see what The Social Network does next with the tool.